Q. 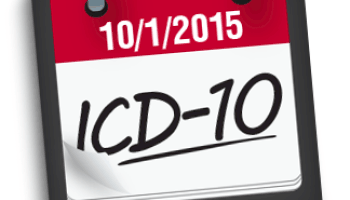 What if I run into a problem with the transition to ICD-10 on or after October 1st 2015? A. CMS is aware of the fact that ICD-10 is bringing substantial changes with it to providers. CMS is expected to establish a center for tracking the ICD-10 implementation which will allow providers to communicate and collaborate with one another. The purpose of the center will be to determine and find immediate solutions to problems that arise from the ICD-10 transition. An ICD-10 Ombudsman will assist in receiving and triaging physician-provider problems. The Ombudsman and representatives in CMSs’ regional offices will work together closely to speak on the concerns of physicians. CMS will provide guidelines on how to report problems to the Ombudsman as the October 1, 2015 compliance dates draws near. Q. What happens if I use the wrong ICD-10 code, will my claim be denied? A. Given that diagnosis coding at the correct stage of specificity is the ultimate objective for all claims, for a year after the full implementation of ICD-10, Medicare review contractors are not in a position to reject the claims of physicians (or other practitioners) billed under the Part B physician fee schedule by means of either a complex medical record review or automated medical review which is founded exclusively on the specificity of the ICD-10 diagnosis code given that the physician (or practitioner) used a valid code from the right family. Despite this, a code that is valid under ICD-10 is necessary on all claims starting the compliance date, October 1, 2015. The possibility that a claim be selected for review due to reasons bar the specificity of the ICD-10 code is likely. Review of the claim might even carry on for the same reasons. Medicare Administrative Contractors, Zone Program Integrity Contractors, Supplemental Medical Review Contractors and the Recovery Audit Contractors will adopt this policy. Q. What happens if I use the wrong ICD-10 code for quality reporting? Will Medicare deny an informal review request? A. Review contractors of Medicare clinical quality data are not entitled to subject physicians or other Eligible Professionals (EPs) to Meaningful Use 2, Value Based Modifier or Physician Quality Reporting System penalties in the duration of primary source authentication or auditing associated with the additional specificity of diagnosis code of ICD-10 given that the physician (or EP) uses a code that is from the correct family of codes. In addition to this, EPs will not be exposed to penalties in the case that CMS faces issues in computing quality scores for MU, VBM or PQRS as a result of the transition to ICD-10 codes. CMS will not reject informal review requests founded on the 2015 quality measures if the EP reported the necessitated type/number of measures and the proper areas on the given percentage/number of patients, and error(s) is/are solely related to the ICD-10 code for diagnosis (given that the physician (or EP) uses a code that is from the correct family of codes). CMS will carry on tracking the implementation and making any necessary adjustments to the timeframe. Q. What is advanced payment and how can I access this if needed? A. Advance payments may possibly be made available in the case that Part B Medicare Contractors are incapable of processing claims in the conventional timeframe due to administrative issues (i.e.. implementations problems or contractor system experiences breakdowns). Advance payments are essentially partial payments subject to conditions and they call for repayment. Advance payments are issued only when the conditions/pre-requisites as per CMS terms and conditions at 42 CFR Section 421.214 are fulfilled. In order to apply for an advance payment, it is obligatory for the Medicare physician or supplier to submit a corresponding request to their Medicare Administrative Contractor (MAC). In the case that there are Medicare systems issues that hinder the processing of claims, CMS and MACs will broadcast information on accessing advance payments. CMS is not entitled to make advance payments if a physician is not capable of submitting a formal claim for the rendered services. Interested in learning more about how we can help you with ICD-10?